I attended with a group from the Landscape Industry Association of WA and I believe they are organising another visit this year although I’m not sure if there are any vacancies at this stage. The first thing to say about the Festival is that it is held indoors in the huge Suntec Convention and Exhibition Centre. The 2 hectares of the festival only takes up a fraction of the space available. The obvious benefit of being indoors is that the heat, humidity and afternoon showers of Singapore have no affect on the displays or for that matter on the visitors who stay fresh and cool in air conditioned comfort. Another benefit is that artificial lighting is an integral part of the displays so it is easy to run the festival until 10pm in the evening. The artificial lighting also makes for some very dramatic displays but it did cause me a few problems because I don’t do much indoor photography and I ended up with a number of blurred images and also the colour balance was out of whack. If you are planning to attend the festival and want to take some half decent photos I recommend that you familiarise yourself with your camera’s features for indoor photography before you go. I cheated a bit by clicking off 2 or 3 shots of the same thing on different settings, hoping one would be OK. Some hardy soles used tripods but when there is a crowd of people around I don’t feel inclined to obstruct the traffic flow. Being indoors also means that printed or painted backdrops can be used to great effect. 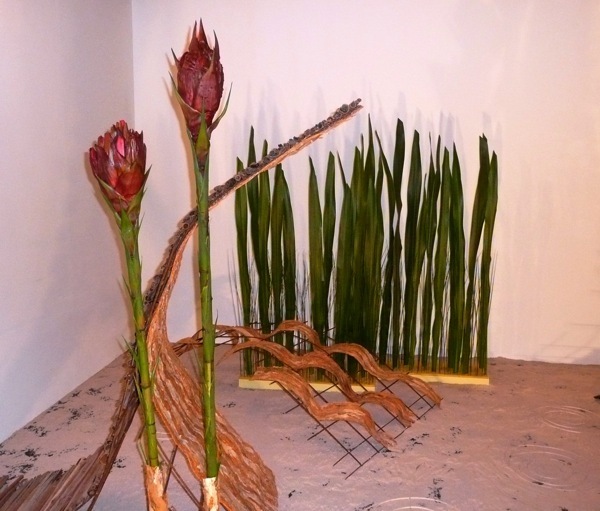 The Fantasy Gardens used the backdrop to reinforce the theme and provide depth to the display while the Balcony Gardens used city skyline views to create a realistic high-rise balcony. 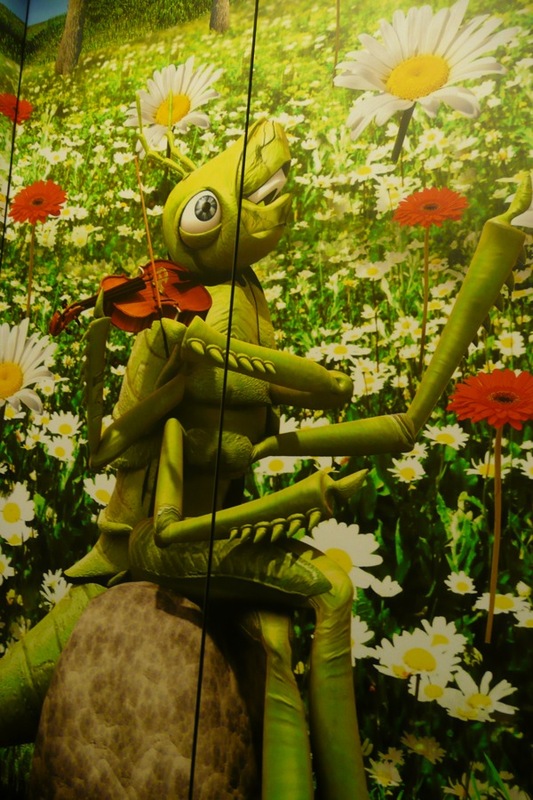 Everything about the festival is of a very high standard and the garden theme is everywhere – the lifts are decorated with beautiful graphics inside and out and when you step out of the lifts into the foyer you are surrounded by bowers of gorgeous orchids and blossoms. 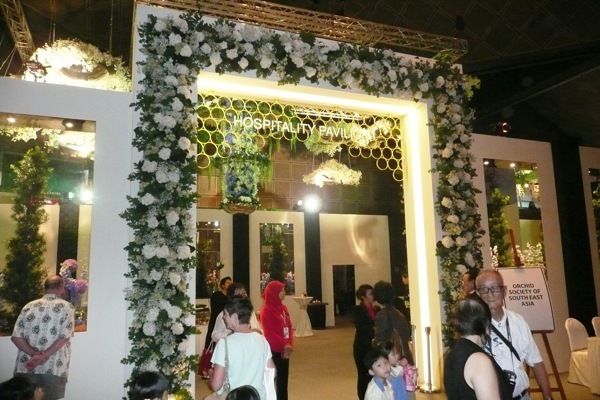 Each of the Hospitality Pavilions is festooned with flowers and even the light fittings are part of the floral decorations. Good signage hasn’t been a feature of any other garden shows I have been to but I found the signage at the Singapore festival to be very useful and informative – it gave easy to read information about the display and insight into what the designer was trying to achieve. 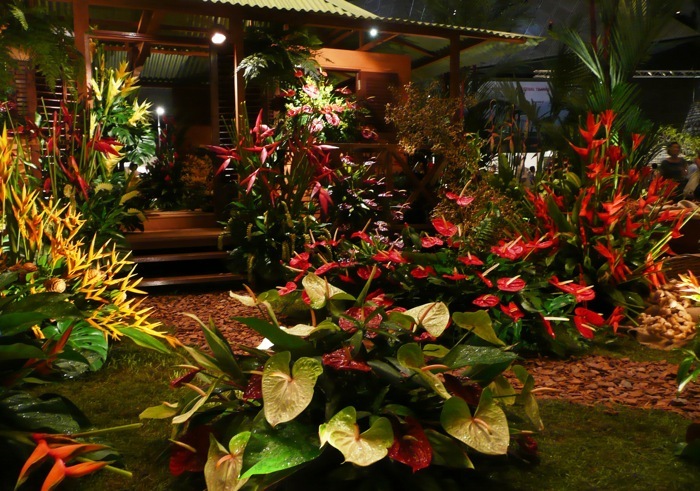 The festival is divided into a number of different areas and categories including Landscape Gardens, Fantasy Gardens, Balcony Gardens, Floral Windows to the World, The Market Place, including a great botanic bookshop and, of course it wouldn’t be Singapore without a fabulous display of orchids. Children haven’t been forgotten as there are activities for children and adults to participate in as part of the Garden Fiesta. The tickets are very reasonably priced (I think we had multi visit tickets) so that you don’t have to cram everything into one visit. I spent a lot of time on the first day looking at all of the display gardens then returned to the Market Place the next day – I also did another quick look around the display area to make sure I hadn’t missed anything. 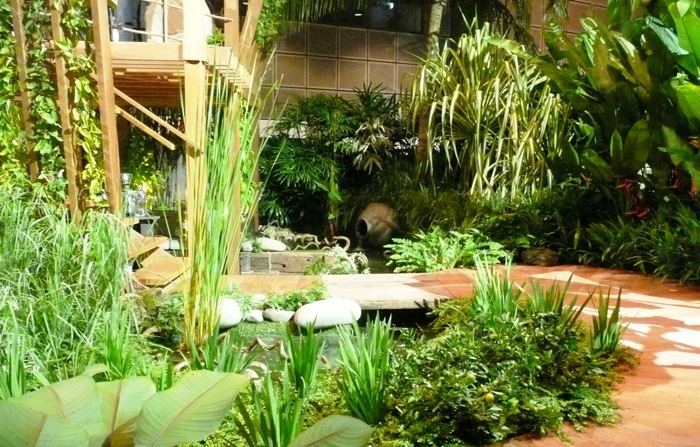 There was a great diversity of amazing gardens displayed, as designers from all over the world vied for the coveted Best of Show awards. In addition to the Singaporean designers there were designers from Malaysia, China, Japan, Granada, USA, Canada, France, UK, South Africa and Australia to mention some that I noticed. This made for a very wide range of styles with many of the Landscape Gardens reflecting the cultural identity of their country of origin. 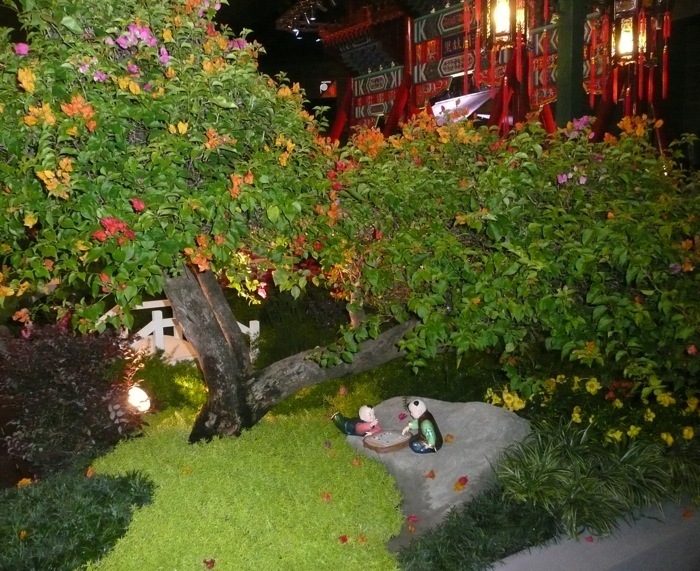 Displaying more whimsy, the Fantasy Gardens in general were less nationally identifiable. 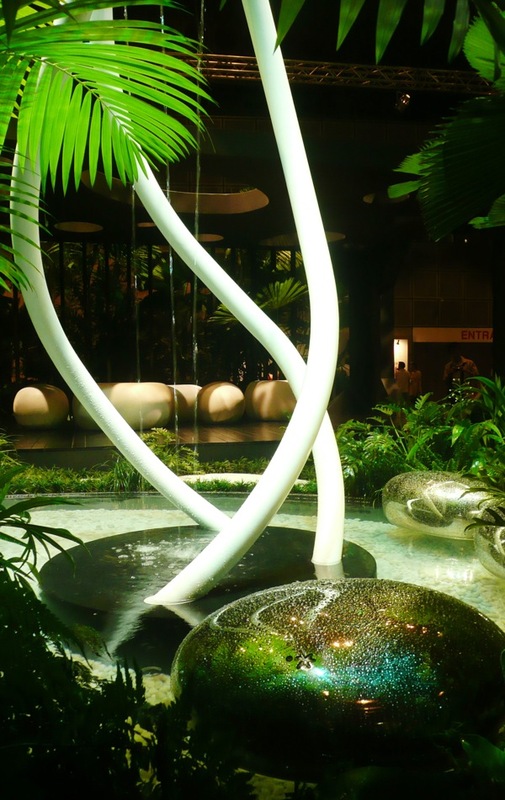 Although there were lots of fantastic gardens to see, two of the Landscape Gardens that I related to and really loved were contemporary, beautifully designed gardens that created inviting outdoor living spaces. 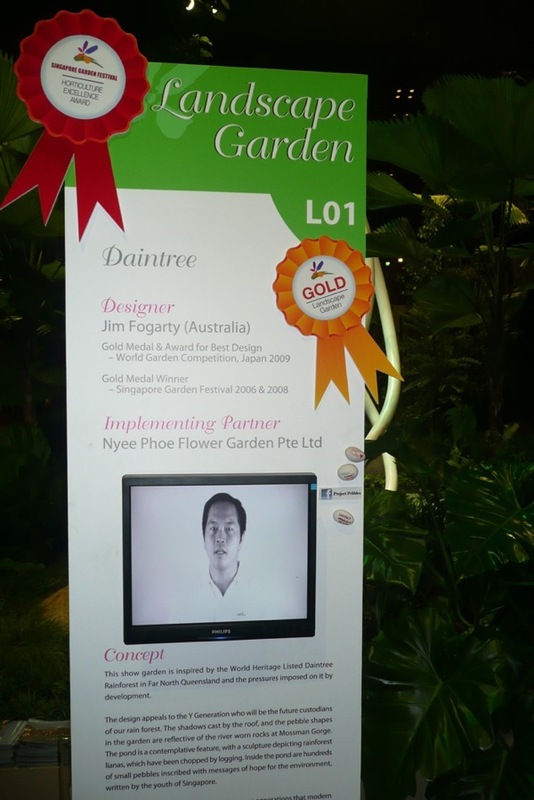 The first garden, entitled Daintree, designed by Australian Jim Fogarty and implemented by Nyee Phoe Flower Garden P/L won a Gold Award. According to the information on the sign the garden was “inspired by the World Heritage Listed Daintree Rainforest in far north Queensland and the pressures imposed on it by development”. The pebble shapes that have been used throughout the garden take their inspiration from “the river worn rocks at Mossman Gorge”. I thought the repeated use of the pebble motif was brilliant. It can be seen in the shape of the cut outs in the roof which would create pools of pebble shaped sunlight on the deck if the display was in the sunshine. The pebble shape can also be seen in the plump rounded shapes of the furniture, the stepping stones, the fence treatment, the porthole in the wall and the gorgeous shiny pebble artworks in the pond. There are also “hundreds of small pebbles inscribed with messages of hope for the environment, written by the youth of Singapore” in the pond. 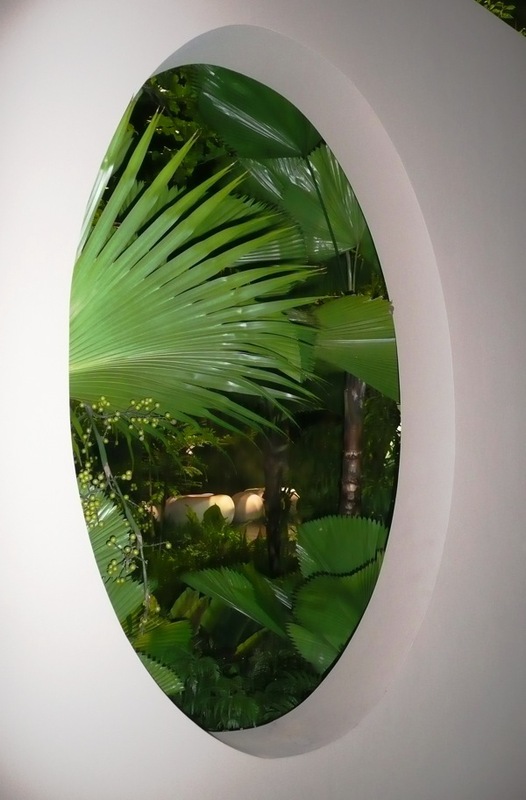 I just loved the simple but bold colour scheme of black, white and green which accentuated the luxuriant tropical foliage to perfection. 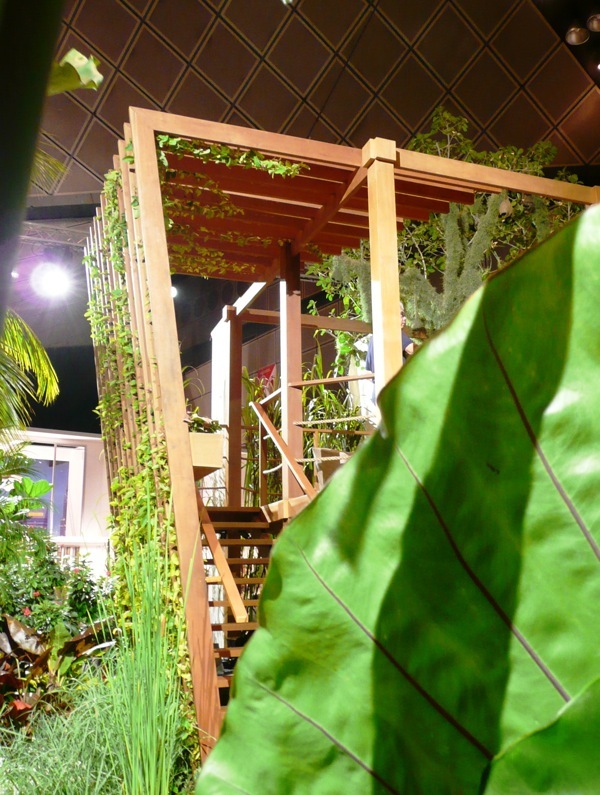 My other favourite garden, called The Tree House – Modern Kampong Lifestyle, was designed by Singaporean John Tan and installed by Esmond Landscape and Horticulture P/L. The timber ‘Tree house’, nestled into a tropical garden, was light and airy with the sharp angles contrasting with the soft foliage. The intricate design of the structure cleverly created areas of shade and privacy without forming a barrier to the sky and the surroundings. Strands of climbers between the timbers added greatly to the charm of the display which won “Best of show” for the Landscape Gardens. 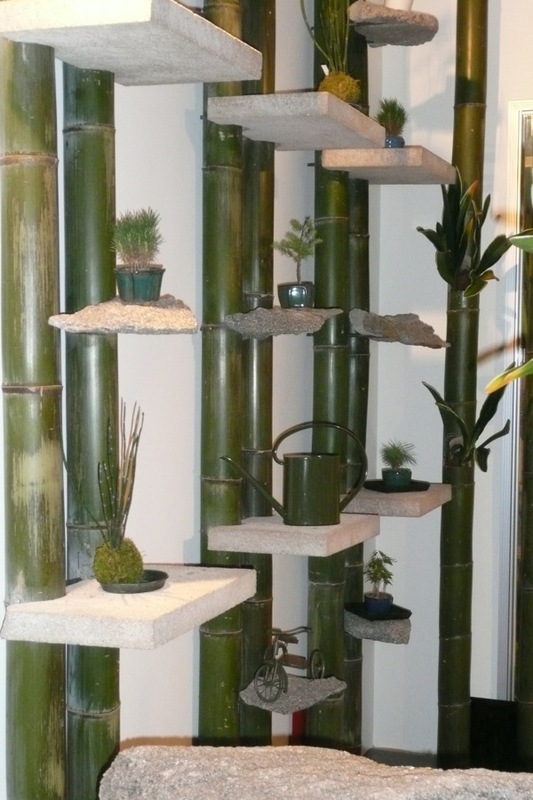 The vertical gardens will have to go into Part 2! i was just looking at some of the photos of the bog landscape gardens from this year’s SGF and one bears some striking similarities to Jim Fogarty’s 2010 garden. Perhaps you can have a look and tell me if you agree?! 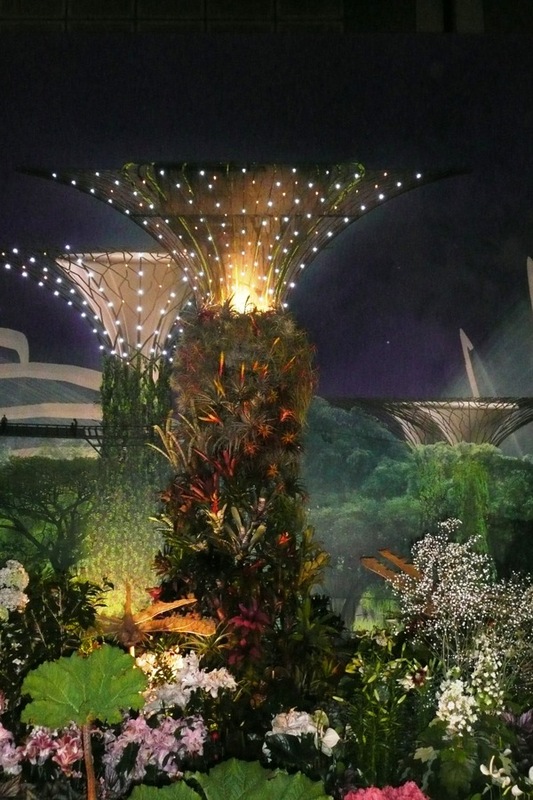 Wow – the video of this year’s Singapore Garden Festival (on GardenDrum) is fantastic. I think I know the garden you are referring to and I agree that there are some similarities but it is hard to be original in this world where we are all influenced by similar images as they are spread via the internet. “Skylights” or cutouts in the roof of shade structures are a growing trend. They regularly feature in homes on the digest Archdaily and I was inspired to try one in my courtyard. The clever thing about Jim Fogarty’s design is that instead of just doing a circle or square cutout he was inspired by nature and used the pebble shape to great effect.